The indirect land use change argument has brought on a whole new level of skeptics, without the science to back them. If you asked the ethanol producing pioneers why they got into the industry, you would get a different response almost every time you asked the question. But broadly speaking, their responses fall into one of three categories: value-added agriculture and the accompanying rural economic development, energy security from a lessening of dependence on foreign oil and the environmental benefits of a low-carbon fuel. 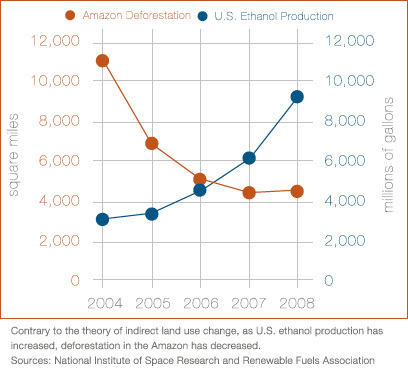 It is the last of those three points – the environmental benefits of ethanol – that is most disputed today. That fact is perhaps a little surprising considering the strides that ethanol production and agriculture have made in recent years. According to a recent study from the Argonne National Laboratory at the U.S. Department of Energy, dry mill ethanol plants in 2006 used 22 percent less energy and 26.6 percent less water while producing 6.4 percent more ethanol per bushel than in 2001. Those improvements are a big part of the reason that new ethanol plants have dramatically decreased CO2 emissions in comparison to plants that were built just a few years ago. A 2009 study from the University of Nebraska-Lincoln found that ethanol plants built in 2005 produced a fuel that is 48-59 percent lower in lifecycle greenhouse gas emissions than gasoline. These are important findings considering that the Energy Independence & Security Act of 2007 required ethanol to have at least 20 percent fewer greenhouse gas emissions than gasoline in order to qualify for inclusion in the 36 billion gallon renewable fuel standard. Additionally, several states and the Obama Administration have indicated their desire to pursue a low carbon fuel standard (LCFS), which would reward fuels that have the lowest carbon intensity. But in the face of these drastic improvements, there is an attempt underway to rewrite the way lifecycle analysis is performed in order to make ethanol producers responsible for emissions that they don’t directly cause. That attempt is the theory of indirect land use change (ILUC), which states that the production of crops for ethanol displaces other crops which must then be grown in other parts of the world, leading to the need for new land which comes at the expense of rainforest. That land use conversion causes a large release of stored carbon, creating a carbon debt that biofuels must repay. The theory of ILUC was virtually unknown until last year when Tim Searchinger, an environmental attorney with no scientific background, penned a paper claiming that when carbon emissions from ILUC were accounted for, ethanol made from corn was worse than gasoline. Since then, a handful of academics, advocates and bureaucrats have pushed an ILUC penalty for biofuels in government carbon accounting standards. It seems simple and maybe even logical. When American crops are used to produce ethanol, farmers elsewhere in the world have to plant more crops to provide an expanding global population with needed food. But that simplicity is partly why the theory is so dangerous, says Dr. Bruce Dale. “I don’t think it has sunk into most people just how radical the idea of indirect land use change really is,” he said. Dr. Dale is Chair of Chemical Engineering at Michigan State University and has been applying lifecycle analysis to biofuels for eight years. He’s also an author of the only peer-reviewed paper on indirect land use change that has been published in a lifecycle analysis journal. And that, says Dr. Dale, is where indirect land use change fails miserably. “Those who are promoting indirect land use change want biofuels to be responsible for the indirect or market-driven effects, but other fuels are not asked to deal with any indirect effects,” he said. “If you’re going to assess indirect effects for biofuels, you have to include the same effects for other fuels.” Without that direct, equivalent comparison, said Dr. Dale, the inclusion of indirect land use change cannot be part of a true lifecycle analysis. In addition, Dr. Dale believes that many of the market-induced impacts blamed on ethanol may actually have been caused by oil. “We know that the cost of agricultural products is driven by the cost of energy,” he said, “just like so many things in our society. A study from Texas A&M University said that conclusively.” Dr. Dale also referenced a study from Purdue University saying that 75 percent of the increase in corn prices last summer was due to oil, not ethanol. According to Dr. Brown, founding director of the Bioeconomy Institute at Iowa State University, many of those conjectures aren’t anywhere as close to dire as those posited by Searchinger and other biofuels critics. “People might respond to higher commodity prices by eating less meat,” said Dr. Brown. An animal must be fed 7 kg of grain for every kg of meat they produce. “Farmers around the world might start using more modern farming methods and increasing their yields. We might also expect Afghan farmers to stop growing poppies and switch to wheat because it was more profitable for them. The most difficult thing for a farmer to do is to go and cut down rainforest.” Yet that is what the proponents of ILUC claim. These flaws in the theory of indirect land use change led Dr.’s Dale and Brown to sign a letter with 109 other PhDs and scientists to California Governor Arnold Schwarzenegger, asking the governor to submit a low carbon fuel standard based on direct carbon effects only and support a rigorous 24-month analysis of the indirect, market-mediated effects of petroleum and the entire spectrum of fuels, regardless of source. Since 1998, corn exports have remained steady at 1.5-2.5 billion bushels sold abroad each year and 2008 saw a record 1.5 billion bushels of soy exported, a seven percent increase over the previous year. Indeed, according to the United States Department of Agriculture’s Long-Term Projections Report released in February, American exports of corn and soy will grow or remain stable through 2015. This flies in the face of the indirect land use change theory, which is built on the claim that American grain exports will plummet because of corn used for ethanol. In his paper, Searchinger himself estimates that corn exports will decrease by 62 percent and that soy exports will decline by 28 percent. Despite lacking an intellectual justification for the theory and the data to support their claims, proponents of ILUC defend their theory by claiming that biofuels has to lead to some land clearing. The number can’t be zero, they say, so it’s better to estimate a number than to omit a probable source of carbon emissions. Dr. Dale isn’t having that argument. “That’s not science,” he said. “It’s blind belief. You don’t know if the number is zero, positive or negative until you’ve done the study. The danger of indirect land use change is very real. Opponents of agriculture and ethanol are seeking to get regulatory agencies to include indirect land use change in their carbon accounting for biofuels. In developing the rules for their low carbon fuel standard, the California Air Resources Board appears prepared to add an indirect land use penalty to corn ethanol that will make it more carbon intensive than gasoline. Meanwhile, early drafts of the regulations being developed by the Environmental Protection Agency for the Renewable Fuel Standard also include an indirect land use change penalty. While it leaves corn ethanol better than gasoline, most corn ethanol could be unable to meet the necessary 20 percent decrease in greenhouse gas emissions in comparison to gasoline. Rob Skjonsberg, the Vice President of Government Affairs for POET, says the agriculture and ethanol producers must work together to beat back this attack.